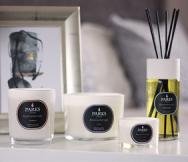 Parks Candles’ ‘3 Tots’ Gift Sets have been handcrafted by our expert perfumers and chandlers to deliver a carefully balanced scent profile that will vastly improve the atmosphere of any home, office or personal space. As part of our Aromatherapy collection, the lemongrass and mint candles inside are made of only the purest smoke-free waxes and the finest scents. Each ‘tot’ candle is poured into a glass votive mini-vase by hand, around one of our finest 100% cotton, soot free premium wicks. Our ‘tot’ candles typically burn for a full 8 hours each and produce a clear, commanding scent all the while. This set of three ‘tot’ candles is delicately scented with lemongrass and mint essential oils. The mint is particularly penetrating and can typically be detected even through the sealed box. However, this is just a hint of the rich, invigorating experience to come. The mint is carefully offset by the richer, more complex tang of lemongrass. As you might expect from the name, lemongrass produces distinct citrus notes, but also incorporates a complex herbal tapestry, as it is made from the young leaves of the plant, and not the fruit or flowers. The combination is simultaneously powerful and subtle, yet will last for many years because of our specially prepared wax, in the unlikely event of the candles sitting unused for that long! The Parks Candles Original 3 Tots Gift Set ships in a lovely gift box which is perfect for presentation on its own, but can also be very easily gift-wrapped.